A group of agricultural scientists has sequenced the genome of a pathogen that causes the wheat disease septoria tritici blotch, responsible for severe crop losses. Their findings appeared 9 June 2011 in the journal PLoS Genetics. The consortium, led by USDA plant pathologist Steven Goodwin included researchers from the U.S., Australia, Brazil, France, Germany, Iran, Mexico, Switzerland, and the U.K. They studied the fungus Mycosphaerella graminicola, which causes the disease that greatly reduces the yield and quality of wheat. The International Maize and Wheat Improvement Center says the disease septoria tritici blotch can have important economic effects in wheat-producing areas, particularly those where high rainfall occurs. Losses can run very high from the disease, as much as 50 percent. The Mycosphaerella graminicola pathogen is known to have a long latent stage, when it takes nutrition from the living plant and evades the host plant’s natural defenses. 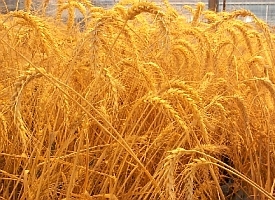 Control of the pathogen or the disease has been hampered by an incomplete understanding of how the organism infects wheat, or how the wheat plant itself resists the pathogen. Sequencing the genome of the pathogen is expected to help answer these questions. The sequencing of the Mycosphaerella graminicola revealed 21 chromosomes, eight of which were different from the core chromosomes. The authors found a lower than expected number of genes for enzymes that break down plant cell walls. They attribute this lower number of enzyme-related genes possibly to an evolutionary response to evade detection by plant defense mechanisms.